Several of our consultants ran into this particularly nasty installation bug. We’re not 100% sure why the problem occurs though some speculation is that Windows Server 2003 Small Business could be a major contributor. 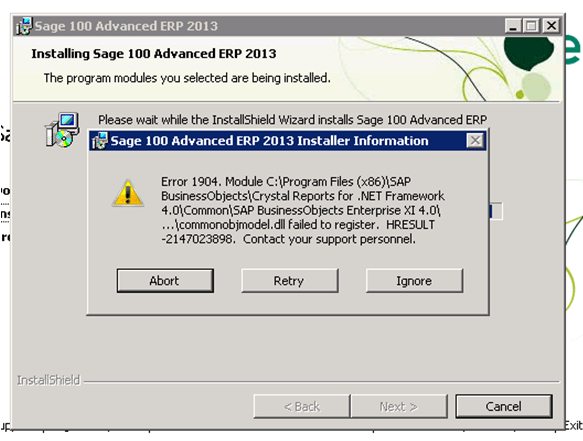 Error 1904 while installing Sage 100 ERP 2013. This appears to occur during the install/registration of Crystal Reports runtime files and/or DLLs. Note: Installing the full version of Crystal Reports may appear to complete but the program might not start up. There can be many causes to this – from the simple (insufficient user rights) to the more complex (conflicting copies of DLL files). Here are several things you can try along with the solution that ultimately worked for two of our consultants in two separate installations. Although this could be a rights issue there is some indication that it may also be caused by .NET issues or one of the prerequisites failing to load or otherwise conflicting. Caution: This has been an especially troublesome issue. Sage has had some difficulty resolving this and on some level it seems like Server 2003 SB might lend itself to the issue through reported non-standard management of DLLs. 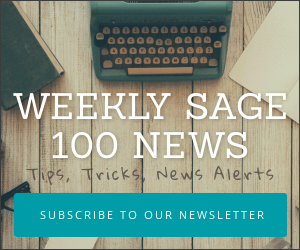 Open a case with Sage sooner rather than later. 1. Search your system for all instances of cryptocme2.dll. 4. Install the Crystal Reports runtime (CRRuntime_32bit_13_0.msi). 5. Rename cryptocme2.org files back to cryptocme2.dll. 8. The system environment variable “R_SHLIB_LD_LIBRARY_PATH” can not be overwritten and thus steps above must be applied.